Bolivia won a legal victory in its fight to reclaim an outlet to the Pacific Ocean, when the International Court of Justice allowed its case against Chile to proceed. Chile had challenged the court's jurisdiction, arguing its authority is limited to treaties since 1948 only. But the court ruled Chile has an obligation to negotiate a settlement with Bolivia. What's next? A full trial, although the court indicated it is not going to judge the results of the two countries' negotiations. Unlike last year's amicable resolution with Peru, Chile is entirely rejecting Bolivia's claims, citing the two countries' treaties. The dispute has its roots in the War of the Pacific (1879-1884), which resulted with Chile winning control of Bolivia's coastline and vast territory from Peru. For Bolivia, it was a specially painful loss, because it not only became a landlocked country but also lost a region that today includes rich copper mines. The war stands as one of the great pivotal moments in Latin American history, and one of the most costly. Chile, Peru and Bolivia are still dealing with its aftermath. There are a couple of excellent books on the war. "Andean Tragedy" provides deep details on the combatants and a detailed account of the entire conflict. "The 10 Cents War" is another commendable work with impartial analysis. 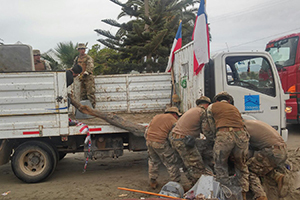 Chile's 8.3-magnitude earthquake and tsunami left considerable damage, and as is customary with every major natural disaster, the armed forces have been called out to help. About 150 Marines were initially deployed to the area of Coquimbo, one of the hardest hit by the Sept. 16 quake, to help maintain security. Much of the area lost electric power, and the tsunami left many buildings and roads damaged. The Navy also has sent its multi-role ship, the Sargento Aldea, to provide medical aid, cleanup, search and rescue and other assistance. The ship has become synonymous with disaster relief because it has the largest carrying capacity of any vessel in the Navy, plus it has a hospital unit. Tapping a special constitutional power, President Michelle Bachelet has put the senior officer in the region, the commander of the Army's 2nd Motorized Division, in charge of security. That gives the general power to mobilize more troops if necessary and coordinate efforts with all branches of the military. There's been no curfew. The mobilization has been much smaller than in the 2010 and 2014 earthquakes, which were more damaging. In fact, more Chileans have died in traffic accidents during the holiday weekend than due to the earthquake. This time, there's been no need for a massive airlift like in 2010 or much clearing to do on streets or highways, where the Army's engineering units can be especially helpful.